Source of Fluoride in Water: Fluoride is a natural element found in bedrock and the soil. Some areas of the US have high levels of naturally occurring fluoride in underground geological formations. Fluoride dissolves easily into ground water as it moves through cracks and pore spaces between the rocks. Fluoride is also added to public drinking water supplies as a public health measure for reducing cavities. Fluorides are compounds that combine the element fluorine with another substance, usually a metal. Sodium fluoride, stannous fluoride, and fluoride monofluorophosphate (MFP fluoride) are common additives. Effects of Fluoride in Water: Fluoridation might increase the risk of osteosarcoma (bone cancer) because fluoride collects in parts of bones that are growing. Population-based-studies strongly suggest that chronic fluoride ingestion is a possible cause of uterine cancer and bladder cancer. Research seems to indicate the potential risks from consuming fluoridated water may outweigh the benefits for some individuals. 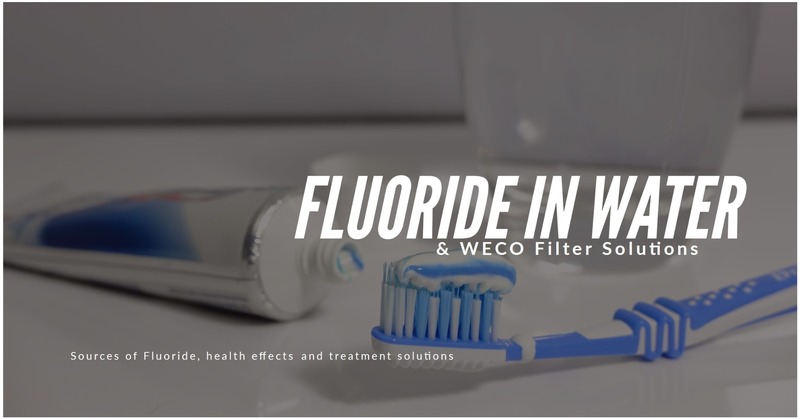 How to Remove Fluoride: For residential drinking water, a WECO reverse osmosis filtration system is the ideal solution. This complete 5-stage water purification system removes fluoride along with suspended particles like sand and grit, chlorine, chloramine, carcinogenic chemicals, pesticides, solvents, and heavy metals like lead, cadmium, copper and arsenic. WECO whole-house and commercial fluoride filtration systems are also available.